The below Parker parts tend to be in stock for immediate shipment. Flow Factor Sells Jefferson 1330 Combustion Valves for Commercial and Industrial uses. Jefferson Valves manufactures a full line of solenoid valves, including 2, 3 and 4 way valves, valves for general purpose applications, air cylinder operation, draining, filling and for gas burner operation. 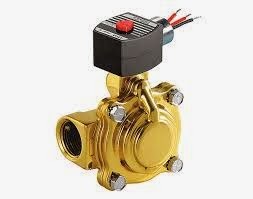 The Jefferson 1330 series come in either direct acting or pilot operated valves. Direct acting valves have a 0 minimum pressure requirements. The Jefferson 1330 series comes in sizes from 1/2 inch NPT to 1 inch NPT. Pressure ranges are 0-15 psi. The standard coil is a DIN coil which is weather resistant and the leaded coils that are either NEMA 4 (YC) or NEMA 7 (ZC). Listed below are a few of the 1330 series valves and links to the website. Combustion valves are used with Air heaters, Industrial ovens, furnaces, kilns, autoclaves and other natural gas or propane fueled equipment. ASCO is the world leader in Solenoid Valves. The below valves are the most common ASCO valves for steam and hot water service applications. Hot water valves have a max temperature of 210F. Temperatures in Degrees Fahrenheit. For quotes and application help, Click HERE. Max steam PSI 110. Max Hot Water PSI 210. Max Steam Temperature is 344. Max steam PSI 125. Max Hot Water Not Rated. Max Steam Temperature is 353. Max steam PSI 110. Max Hot Water PSI 200. Max Steam Temperature is 344. Max steam PSI 125. Max Hot Water 150 - Max Steam Temperature is 353. Max steam PSI not rated. Max Hot Water 100 - Max Steam Temperature is NR. Max steam PSI 50. Max Hot Water not rated. Max Steam Temperature is 300. Max steam PSI 200. Max Hot Water not rated. Max Steam Temperature is 388. CARLO GAVAZZI is pleased to announce the expansion of their Conductive Level Controller product line, which enables customers to have easy-to-use, cost effective level control with a broad range of conductive liquids. 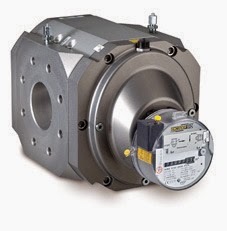 Each of the new controllers provide precise filling or emptying control of liquid levels between two different points. Two basic styles are available, in order to meet a diverse range of application requirements. All of the models provide one SPDT relay output, which is rated up to 8A, 250VAC. The powerful but slim CLD2EB1BU24 provides three sensitivity ranges plus a fine tune adjustment from 250Ω to 500kΩ, enabling for control with a wide variety of liquids, such as salt water, sewage and chemicals. 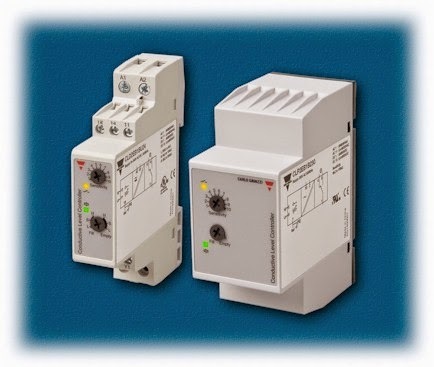 DIN rail mounting and universal 24-240VAC/DC supply voltage simplifies installation, and the 17.5mm housing width minimizes panel space requirements. For more cost sensitive applications, the economically priced CLP2EB1Bxxx retains the reliability and many features of the CLD2EB1BU24, at a lower price. 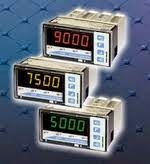 This model provides a single mid-range sensitivity adjustment from 5kΩ to 150kΩ, and supports many common applications. Mounted via an 11-pin DIN-rail mountable socket, four different models are available for operating voltages of 24VDC, 24VAC, 115VAC or 230VAC. In addition to the new CLD2EB1B Series, the entire family of Conductive Level Controllers, including single- point control with timer, 4-point control, and cascadable controllers are available from CARLO GAVAZZI and FLOW FACTOR. Use our Level Application Form to describe your application and get a quote.